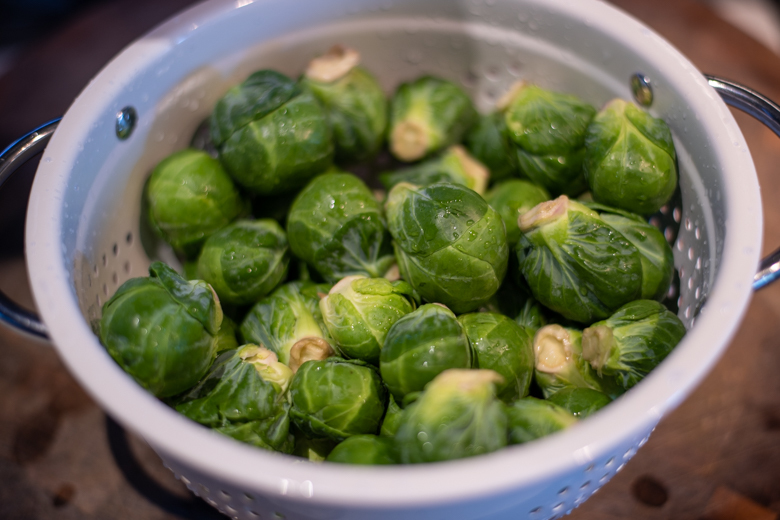 Back in the day you were a kid, and you hated Brussels Sprouts. Mom would make them every now and then, but when she did, she’d boil them, and then try to cover up that awful aroma with butter and salt. Ugh. I remember them boiling, they ended up being this gross green color, and smelled like … Well, you know. But it doesn’t have to be like that anymore. I’m going to share with you a copycat recipe for my favorite restaurant’s Brussels Sprouts. They’re delicious, bright green, and not your normal flavor profile. I think you’re really going to love them! The first order of business is to pre-heat your oven as high as it will go, preferably 500F. Second is that you need a large sheet pan. This is how you’re going to get 2 pounds of Brussels Sprouts seared in all the right places most efficiently. First, you oil the pan liberally. This ensures that the cut edges of the Brussels Sprouts won’t burn. Then, you toss the halved Brussels Sprouts in oil of their own with a little salt, which makes certain that their tops heat up evenly as well. Turn all the halves cut side down with no leaves underneath. This makes certain that you get that lovely sear on each, and every one of them. You can leave rouge leaves in the mix too, they make for delightful crispy bits! This is the secret weapon: carrots and fennel. The sweetness of them both plays really well with the subtle bitter notes of the sprouts. SO GOOD. Matchsticks always look so great, but a julienne or even rounds on the carrots will work just fine too. If you’ve never used fennel before, it can be a bit tricky. Structurally, it’s like a cross between celery and a cabbage. 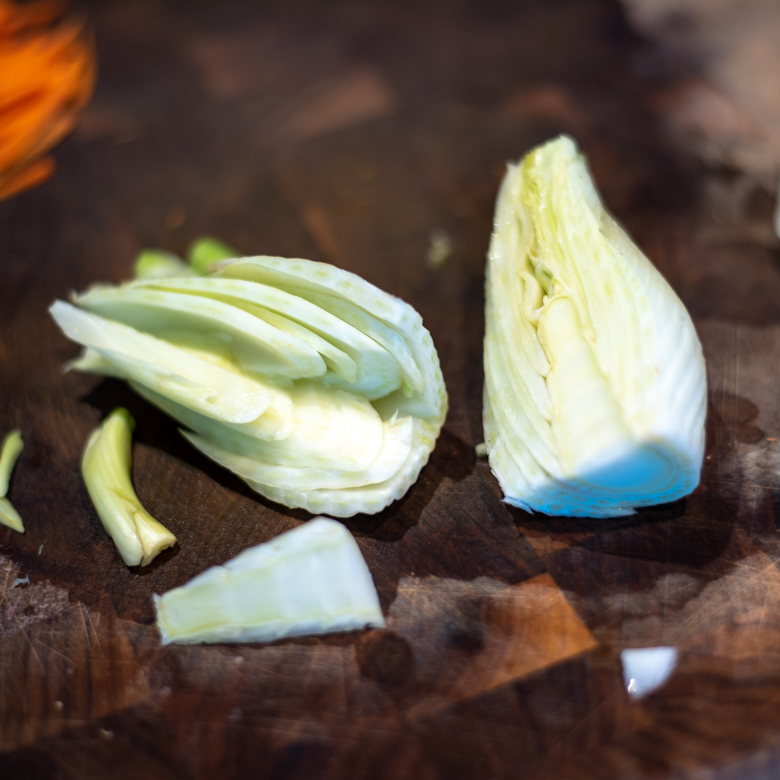 It’s stalks and bulb are like celery, but it does have a core that needs to come out before you try to make a nice julienne. It’s pretty tough. 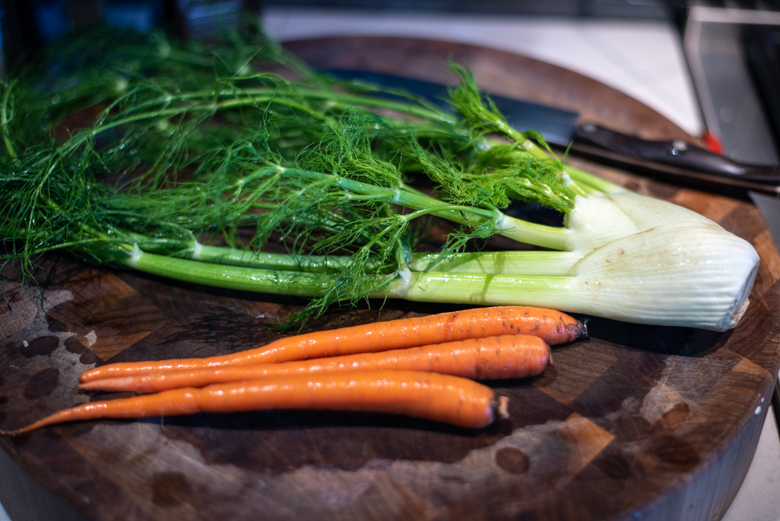 Toss your julienned carrots & fennel with a bit of olive oil, again, so they don’t burn, and you’re all set! It’s a 10 minute ordeal, and then you’re done! You first put the Brussels Sprouts in the oven, and after minute 7, add the oiled matchsticks. After minute 10, remove from the oven, and pour a good bit of the sauce all over them. 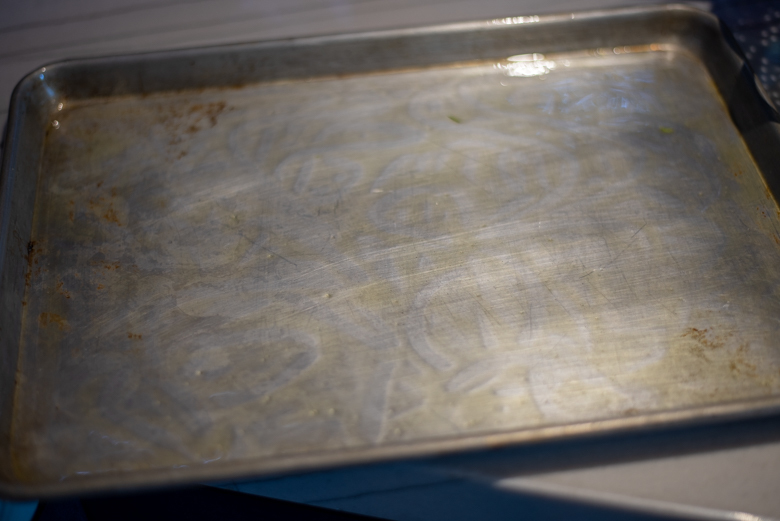 Make sure you do that only if you have a rimmed baking sheet. Otherwise, use a bowl. Serve immediately! 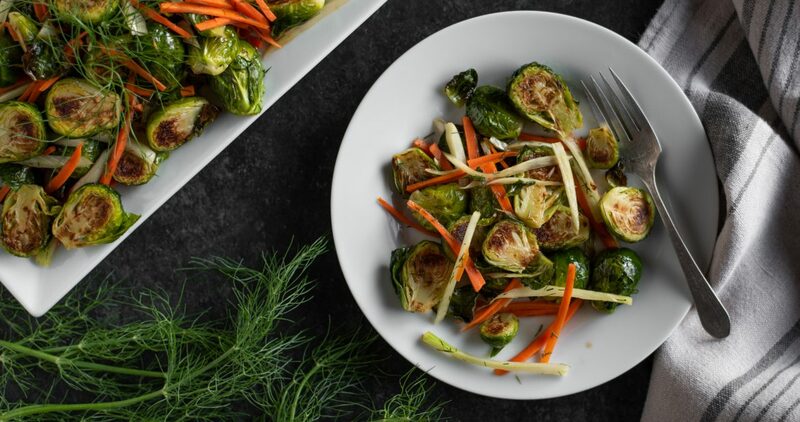 Brussels Sprouts are so great for you. Did you know that they’re one of the 50 best plants on the planet1? They aid digestion with their fiber, and help skin and eye health with vitamins A, C, E and K. It also boosts your metabolism with generous amounts of folate, B6, thyamine and riboflavin. 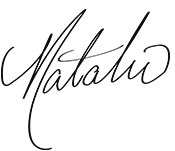 Riboflavin (vitamin B2) is vital for multiple chemical reactions within your cells which helps you metabolize fat, protein and carbohydrates. Your liver and eyes also benefit from this particular powerhouse vitamin! 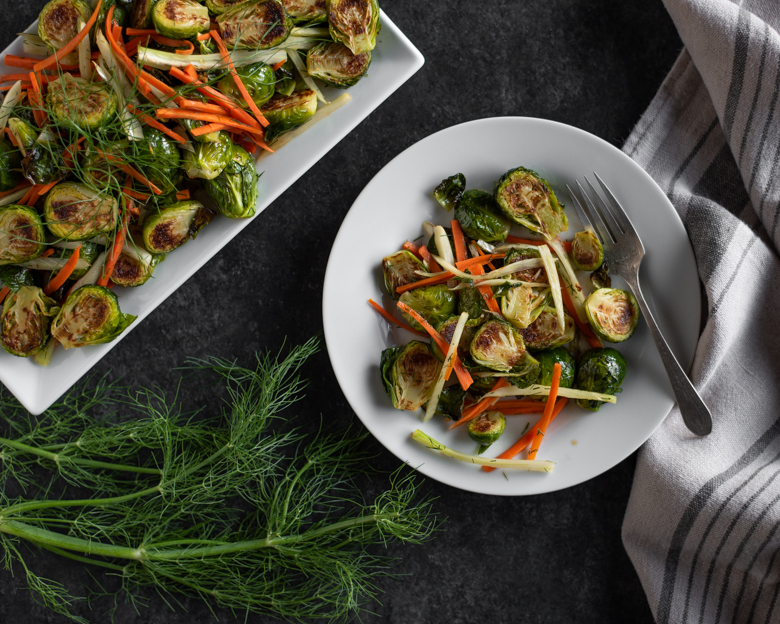 It doesn’t stop there either, the Brussel Sprout also contains powerful antioxidants, and has anti-inflammatory properties. Omega-3 fatty acids? No problem! One and a half cups of this veg contains more than a third of the daily ALA amount included in the National Academy of Sciences’ Dietary Reference Intake recommendations2. 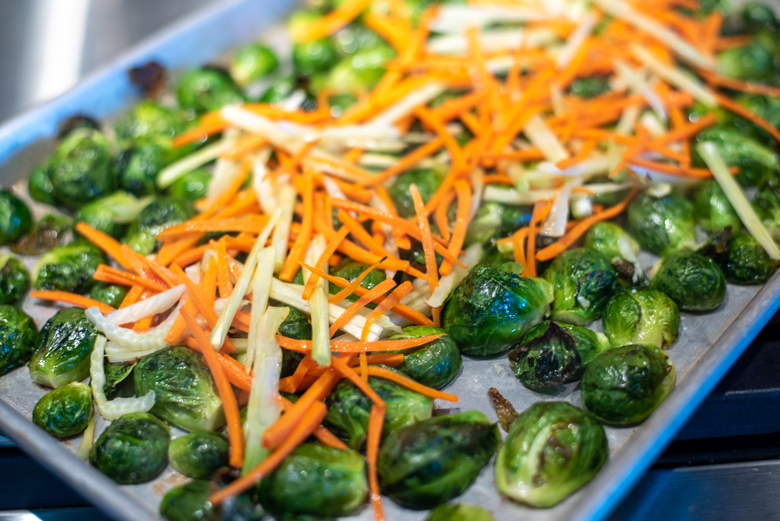 I hope you enjoy this preparation for Brussels Sprouts, and that you incorporate them into your diet more often! They’re amazing for you, and this recipe is out of this world, so it’s a win-win! As always, please remember to share your creations on Instagram with #thedevilwearsparsley, or tag me on Facebook! I love to see your creations! A powerhouse veg, the Brussel Sprout contains so many vitamins and minerals, there are too many to list. It's one of the 50 best plants on the planet, and with this recipe, not only will your body love you, but your taste buds will too! In a saucepan, add all the ingredients for the sauce, and bring to a simmer over medium-high heat. Once simmering, turn heat down to medium, and cook for about 5 minutes to reduce the sauce a little bit. Turn the heat off, and set sauce aside. Drizzle 1 Tablespoon of the Olive Oil on a rimmed baking sheet, and using your hands, spread it thoroughly over the sheet. Trim and halve the Brussels Sprouts, and place in a large bowl. Add 1/2 tablespoon of the Olive Oil, and 1/2 teaspoon salt, and toss well. 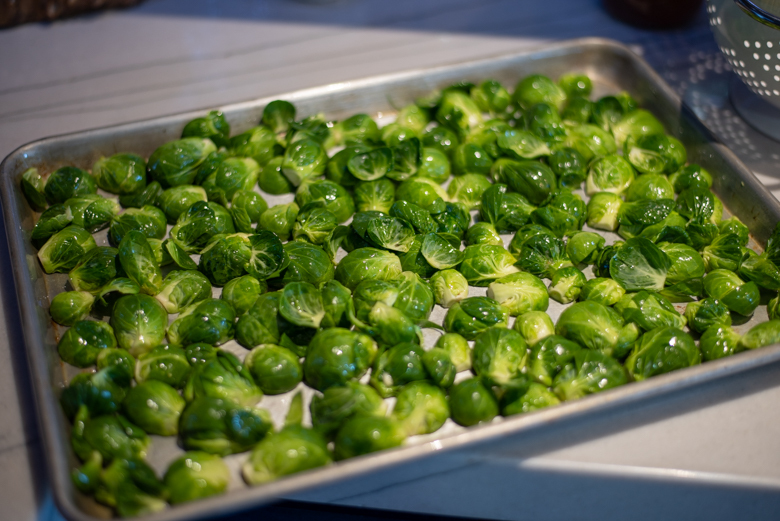 Pour the Brussels Sprouts on the baking sheet, and arrange them all cut-side down. Place in the oven, and bake for 8 minutes. While the sprouts are baking, cut the carrots into 2 inch matchsticks. I cut the carrot in threes, then make planks about 1/8" thick. Then, I cut the planks into strips, again, 1/8" thick. Trim the fennel of it's bottom, and the top parts, leaving the bulb. Slice down the middle of the fattest side, and cut the core out. Cross-section the half into two pieces, length-wise, and then cut into thin strips. 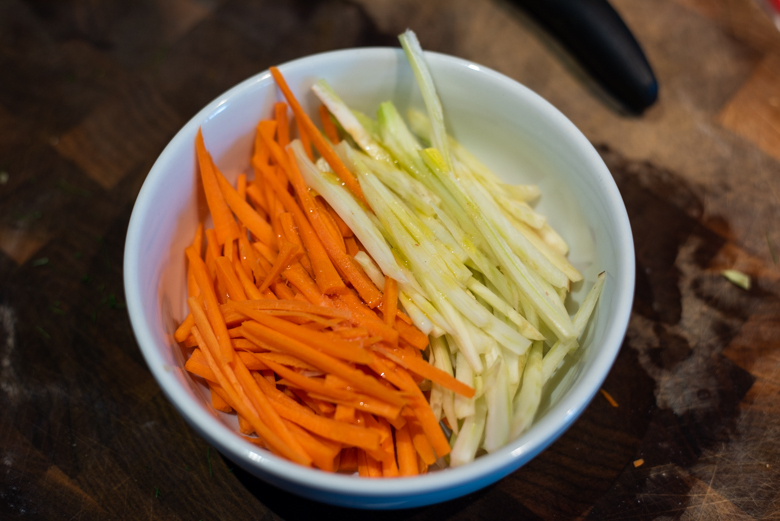 Place the carrots and fennel in a small bowl, and drizzle with the remaining olive oil and salt. 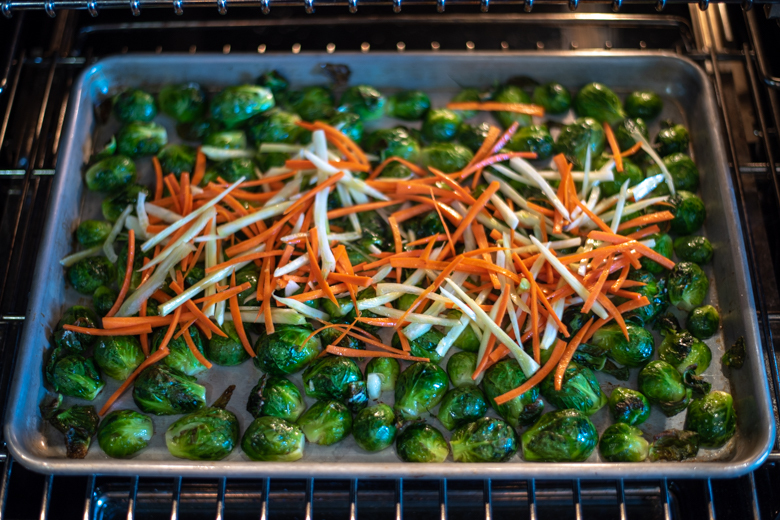 Once the sprouts have passed the 8-minute mark, pour the carrots and fennel over the sprouts, leaving the sprouts face down and not moving them. Return the pan to the oven to cook for 2 minutes more, until the carrots and fennel are only slightly cooked, and still very crisp. 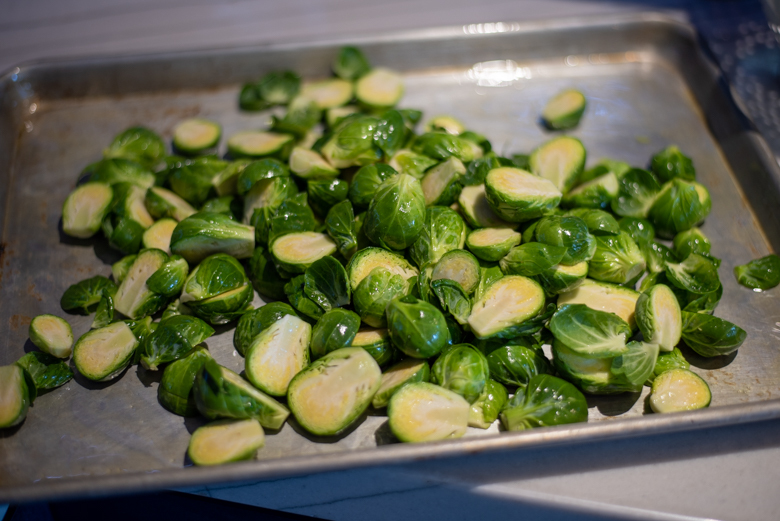 Remove the sheet from the oven, and pour the sprouts in a large bowl. Add the sauce and toss. Garnish with fennel fronds. Serve Immediately. 2The Beauty Detox Foods By: Kimberly Snyder, C.N. What a beautiful dish, and it sounds amazingly delicious! 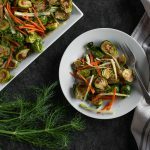 I was just thinking that we haven’t had roasted Brussels Sprouts in so long ~ I am definitely going to give this recipe a try!! 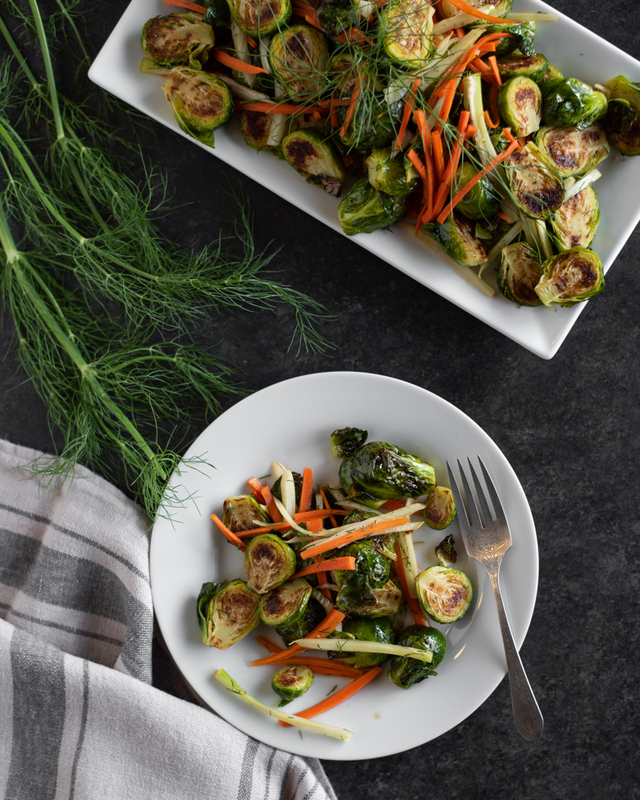 I love the addition of fennel and carrots to roasted Brussels sprouts. YUM! I wish I could take credit for that, Cathy! The Salted Pig in Riverside gave me the idea! It’s divine.